The winter solstice takes place on the shortest day - and longest night - of the year. In 2018, the winter solstice will happen at 12:15 p.m. on Friday, December 21, in the Washington D.C. area. 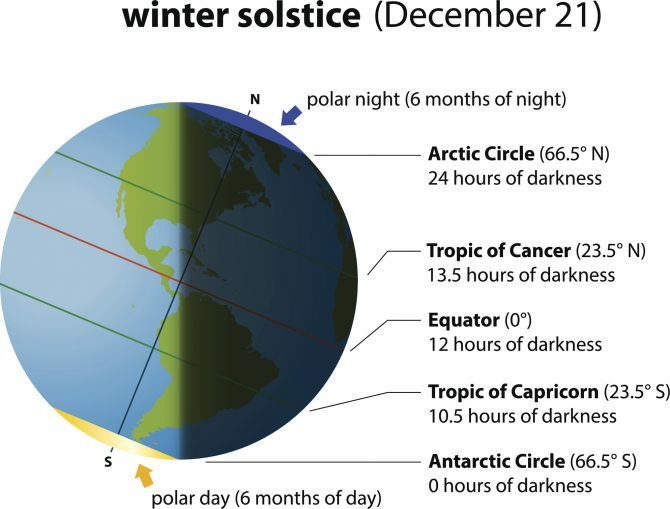 This site will help you find the exact day and time of the winter solstice in your area, as well as the particulars for the summer solstice and the fall and spring equinoxes. According to our calendar system, the winter solstice can fall on December 20, 21, 22, or 23. That is true for those of us living in the Northern Hemisphere who are experiencing winter. However, because of the Earth's tilt, those in the Southern Hemisphere are having their summer solstice in December. Likewise, their winter solstice is in June. The solstice itself refers to a particular point in time on that day, but most people celebrate the solstice (also known as midwinter) as an all-day (or all-night) occasion. At Stonehenge in England, sunrise on winter solstice illuminates a particular part of the henge monument. Neolithic monuments Newgrange in Ireland and Maeshowe in Scotland are also aligned with sunrise on the winter solstice. The Incan empire, located in the Southern Hemisphere, celebrated winter solstice in June at an event called Inti Raymi ("sun festival"). This was marked by fasting followed by cups of sacred beer and animal sacrifice. Pagan Scandinavia and Germany had a 12-day midwinter festival called Jul (pronounced Yule). The particular god of these feasts was Jólner. Modern pagans following in these traditions continue to observe Jul. Yule logs come from this celebration. Saint Lucia's Day, taking place at about this same time particularly in Scandinavian countries, honors an early Christian martyr. Young girls wear crowns of lit candles and wear white dresses with red sashes. In Eastern Europe, pagan Slavs celebrated Koliada, named for the resurrected infant sun. These days, Koliada refers to the custom of young people and children traveling from house to house singing and having fun on Christmas Eve. In Japan, there is a custom of soaking oneself in a hot bath scented with yuzu, a citrus fruit, on Tōji, the winter solstice. In Iran, Yaldā night is celebrated during the Northern Hemisphere's winter solstice. It is a time of family gathering, usually at the house of the eldest family members, with eating, drinking, and reading poems. In Western Christian tradition, there is Blue Christmas (also known as the Longest Night) observance, when some churches hold a special service that honors people who have lost loved ones during the year. In East Asia, particularly those areas influenced by Chinese culture, the Dōngzhì Festival is held at the winter solstice. It is an important time for families to get together, enjoy special foods, and worship together. As the dark night of winter gives way to future summer, check out these books for stories of the season, crafts to try, and information about our wintry world. The shortest day in the year has been observed and celebrated for millennia. Whether you are interested in its scientific or cultural aspects, you'll likely find much to discover here. You will also discover ways to make the most of the season. Cold or not, you can still camp and garden and make your world beautiful. Just because it's cold outside doesn't mean that all harvests must end. A backyard gardener shares how you can enjoy fresh vegetables grown even in the depths of winter. Even when inches of snow cover your garden. Let a florist show you how to use appropriately wintry materials and flowers to create lovely home decorations. Join "Happy Camper" Kevin Callan as he teaches you how to survive - and enjoy - a winter camping retreat. Twelve stories from the very different countries share other cultures' traditions on celebrating the winter-dark's ending and the light of warmer days slowly returning. You'll find this one in our folktales section. How to use locally sourced winter vegetables in a variety of delicious recipes. Also available as an eBook. Join friends Alice and Zach (and some clever chickens) as they follow the seasons by observing the world around them. A fun look at a year's worth of changes that includes a healthy dose of science. This is a picture-book look at the science behind and history of the solstice. It includes simple experiments and information on how Egyptian, Chinese, Incan, and European astronomers observed the solstice.